Hi everyone, Katie here. Again. Well what do you know. Glogirly actually owns some non-black footwear. Who knew. I guess there is hope for her after all. More importantly, there is hope for me. Wait a minute. 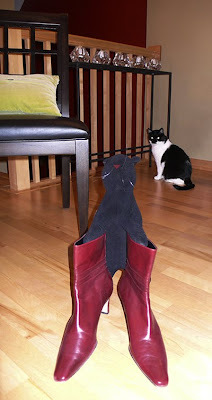 Black Cat Red Boots. Now that's just wrong. I think you would look pretty spiffy in those red boots, Katie. 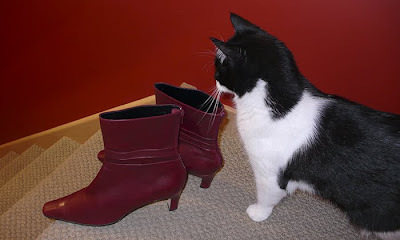 We can't believe black cat got to try on the boots, Katie!! We think red is your color, Katie! Pretty red boots. They look much better with you than black cat! 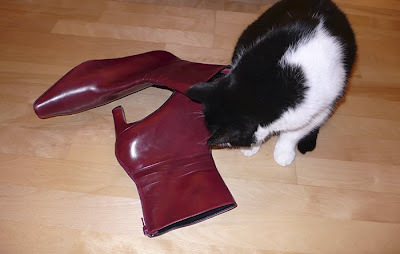 After a red cat you have pretty red boots.. I say take Black Cat down to China Town Katie. Those boots were made for walking (or at least sitting around and looking cute).